• Proximity sensors from Festo are sensors specially adapted and optimized for use with Festo actuators. They detect the magnetic field of permanent magnets built into the piston of the cylinder, thus indirectly indicating the position of the piston rod. • The available range covers freely configurable proximity sensors, modules, and solutions for special applications such as explosion protection, acids, food, cooling lubricants, weld field, etc. • The sensors in the SIE… series keep a close watch on all metals. From detection through to distance measurement of metallic objects. • Diagnosis and condition monitoring processes can be simplified by monitoring flow rates. An altered flow rate is often an indicator of impending problems. In addition, the quality of finished products can also be monitored. • The SVE4 signal converter converts the analog output signal of a sensor into switching points, which can be directly taught on the signal converter. Perfect everywhere where the accessibility of sensors is limited. 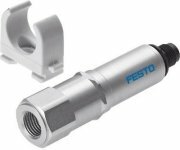 • Smooth and harmonious fit and function: the sensor portfolio from Festo. Perfectly adapted to one another, the NEBU modular cable system links sensors and downstream analysis units – no more connection problems. • Pneumatic, electric or inductive sensing of semi-rotary actuator end positions is possible with corresponding limit switch attachments, which are screwed directly onto the actuator. • The sensor boxes feature sturdy construction for use in rough environments and can withstand corrosive and dusty environments. A ideal product for the entire process technology spectrum. • Extensive range of accessories for every application.